This reading guide is perfect for understanding the context and impact of The Gettysburg Address. Guide focuses on background and speech analysis. 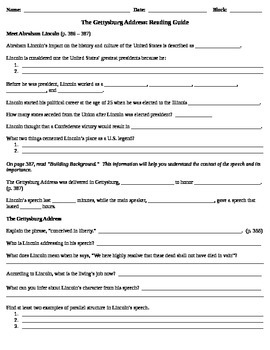 The speech analysis portion asks students to explain important quotations from the speech, to create judgments about Lincoln's character based on his speech, and identify 3 examples of parallel structure in the speech. Pair this reading guide with my "Gettysburg Address Opinion In-class Essay."